As The Wedding Present perform their debut albums anniversary, Getintothis’ Denise Hodgkinson is on hand to join in the celebrations. The Wedding Present take to Wrexham’s Central station to celebrate the 30th anniversary of their debut album George Best. The evening begins with a spirited set from London duo Young Romance, whose first album, Another’s Blood, was released late last year. Described as Noise Pop, they comprise Claire on vocals and stand-up drums, and Paolo on chainsaw guitar. With sometimes celtic-tinged vocals, they are definitely in the spirit of the current 80s revivalist indie-pop, albeit at the more grungy end of the spectrum. 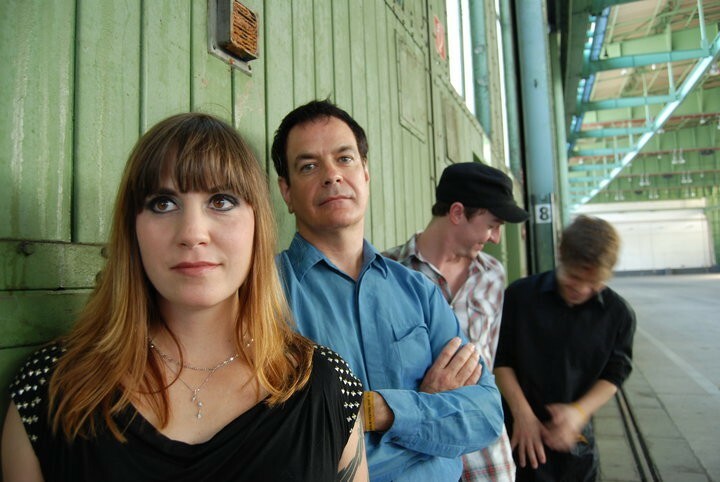 David Gedge is the only original member of The Wedding Present, but the line-up he has around him now is more than adequate for his needs, presenting as a proper band and not just a frontman and backing band. Before they present George Best, there are a few warm-up songs, including Broken Bow and Loveslave. After which Gedge apologises to the audience for the video, urging us not to look it up on YouTube. They play to a pleasingly mixed audience including the expected men of a certain age, but also young indie-kids with Bobby Gillespie haircuts. It begins with polite foot-tapping and head-nodding and ends up with a full-blown (albeit small) moshpit. This looks like the best night out some of the audience have had for years. The main event is received with unalloyed enthusiasm with highlights including My Favourite Dress and Give My Love to Kevin, ending with a blistering You Can’t Moan Can You?, where Gedge’s hand is a blur as he thrashes his guitar with the same energy as he did thirty years ago, although he looks visibly relieved at the end of a couple of the songs. ‘Here’s a quiet one. Nah, I’m joking, I didn’t write any quiet ones’, he quips. Gedge reminds us that there will be no encore as is their custom and then launches into a sizzling version of Kennedy, sending the faithful over the edge, pogoing and moshing with abandon. He bounds offstage, probably to stick his hand in an ice bucket. As Gedge had mentioned, this will be the final time that George Best will be played in Wales but they don’t need to rely on past glories as last year’s album, Going, Going, testifies. With the enthusiasm of their loyal audience and the standard of the new line-up,The Wedding Present’s future is assured.